Bred and selected by the USDA from the cross (B5141-6 (Lenape) x Wauseon) in 1969. 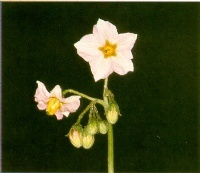 Released in 1976.
medium large, upright; stems thick, purple at the base with an irregular pigmentation pattern upward; nodes slightly swollen; wings prominent. close, smooth, bright green, moderately pubescent. Terminal leaflets: large, ovate; tip cuspidate; base obtuse, asymmetrical. 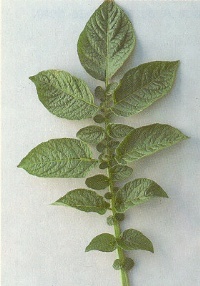 Primary leaflets: large, ovate; tip cuspidate; base obtuse, mostly asymmetrical; three pairs. Secondary and tertiary leaflets: numerous. 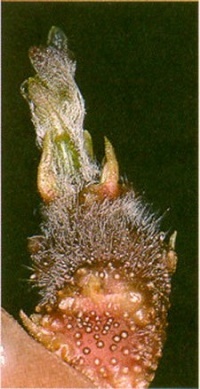 numerous, pale lavender; heavily pubescent buds having diffuse lavender pigmentation on a green background. 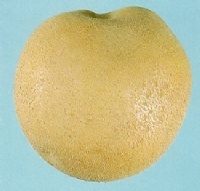 oval to round, smooth; lightly netted to heavily scaled white skin; shallow white eyes; white flesh. High yielding variety, attractive appearance; good tuber set and uniform tuber size and shape. Widely adapted but not recommended for dry sandy soils. Moderate fertilization, close spacing between plants and proper timing of overhead irrigation will prevent the production of oversized tubers that might have hollow heart. Low total glycoalkaloids and high total solids. Medium dormancy period. 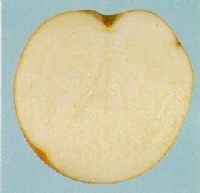 Atlantic is the standard for potato chip quality in Canada and United States. good for boiling and baking, excellent for chipping and french frying. common scab, late blight, bacterial pink eye disease, verticillium wilt.